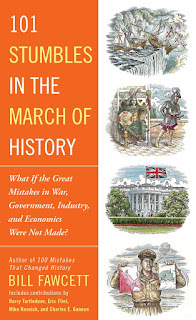 I had the opportunity to interview historian Bill Fawcett who, along with other contributors, wrote the 101 Stumbles in the March of History. Check out our conversation below and keep scrolling to read an excerpt from the book. Welcome to Alternate History Weekly Update, Bill. How would you describe yourself to someone you just met? I suppose that I would say that I am someone who enjoys history and sharing the amazing things I discover about it. If forced to choose a title, I suppose “Pop Historian” might fit. Maybe that I am more than a little cynical because those in power never seem to learn from history and optimistic that history shows nations often overcome the worst of leaders and their mistakes… but not always. I discovered science fiction and history spending my early summers reading in the shade of a tree in our front lawn. Whether it was Tom Swift Jr, Rick Brandt, boy scientist, and Tom Corbett, Space Cadet or accounts of battles and life in ancient times the road noise and neighborhood just disappeared. As I grew older I realized that much of the Science Fiction I loved was derived from events that actually occurred. Once I began writing and editing there was a real revelation. You can’t make it up story elements that are as amazing as what has really happened in the past. From Game of Thrones being loosely based on the equally cut throat events in the War of Roses or the campaigns of Belisarius being the inspiration for novels by David Drake, those writing SF and fantasy often use the past as a model. I suspect it was almost inevitable that the two should merge directly into what we now call Alternate History. I guess I’ve been imaging what would have happened if the Huns had conquered Rome or if Napoleon had left Moscow in time all my life. Back in the 1980s I helped put together with historian Dennis Showalter a “What If” book on WWII alternatives. From then on I was hooked. 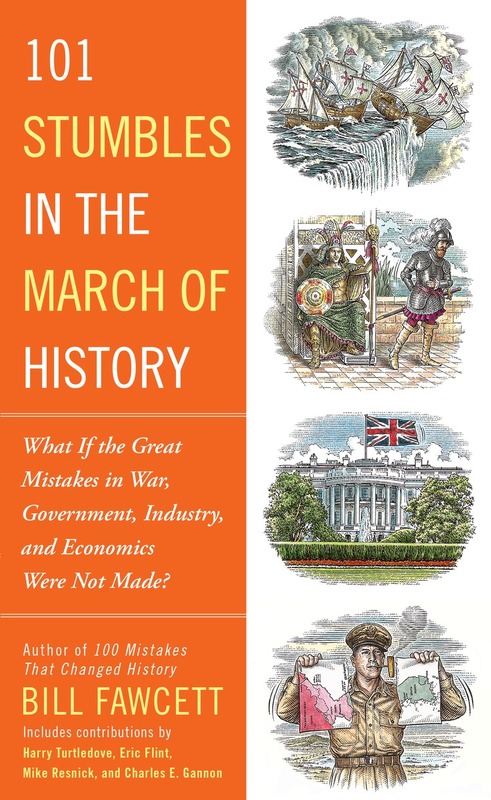 What is 101 Stumbles in the March of History about? So much of our history is the result not of great plans and brilliant strategies, but what happened when those went wrong. Mistakes and their consequences are a great moving force through history, for the better or worse. Progress is never inevitable. I have done two other books for Penguin on great mistakes and how they affect history, these are the not too subtly named 100 Mistakes that Changed History and Trust Me, I Know What I'm Doing: 100 More Mistakes That Lost Elections, Ended Empires, and Made the World What It Is Today. This new book is a look at yet more history changing events and something more, what if. My editor at Penguin was generous enough to say that in this volume we could pull out the stops and also speculate on how life would be today if 101 of the worst mistakes in history had not been made. It was impossible to resist. I’ve been doing it in my head and in discussions with the other writers in earlier volumes for another publisher for years. How did you find the other contributors to 101 Stumbles? I did write about half the mistakes. A few other contributors are historians whom I had worked with before. They share the view that history is fascinating and can be written like it is both interesting and relevant. Beyond them I reached out to those who write Alternate History fiction. I was fortunate enough that some of the best, Harry Turtledove, Eric Flint, Mike Resnick, and Charles Gannon agreed to join in. Their insight and unique approaches really add to the book. Your story "The Last Crusader" is one of my personal favorite stories of yours. What inspired you to make Napoleon a priest? I have always been fascinated by the Napoleonic Wars. They were really the last of the wars where the man, not the weapon, still made all the difference. The great uniforms and pomp don’t hurt either. The survival of Revolutionary France was a near thing. What if Bonaparte was on the other side of the equation? If you lived in Corsica, a poor island controlled by France, there were only few ways to escape the poverty and really achieve something. Beyond smuggling there was only the church or the army. The story speculates that the ambitious Napoleon choose instead to become a priest. He would have quickly risen in the ranks of the Church. This would have meant he was sympathetic to the monarchies and nobility who supported the Catholic Church extensively. In the story we see Bishop Napoleon, a fiery speaker and émigré’ leader, successfully inspiring the Austrian and Russian troops to defeat the godless Revolutionary French at Austerlitz. Just one different choice by him as a young boy and it just might have been. Are there any other projects that you are working on? I am actually researching an alternate history where the very secular Kurds managed to be united as a single nation and the Middle East in the near future is a far different place. They are an amazing people, and tough as ISIS is constantly finding out. If the British had just drawn a few boundaries differently or the UN had lived up to their charter on borders and ethnic groups, it might have been. This will likely be for a military oriented SF novel. (Beyond keep you day job?) My first bit of advice is write, often and anything. The second is to write about what you are passionate. Learn the technical skill of writing, whether its fiction or non-fiction, the skill is necessary. It is like tennis or programming, you need to practice and get better. Those reading you want to enjoy and learn from what you write. What it really comes down to is do what you love, share what excites you and it will show. It will show in your books. It took two mistakes, both classical in all senses of the word, to bring down the world’s first democracy. There have been times when superstition in the form of omens and prophecies affected a battle, but there was one omen that lost Athens the entire Peloponnesian War. Athens had been winning a protracted war with Sparta and that city’s allies. It appeared to almost everyone that Sparta was about to lose and just one more push was needed. But military actions are expensive, particularly for Athens, which traditionally paid the rowers and other sailors. This meant they had the best and most enthusiastic crews, but this was costly. Then one of the city’s most ambitious and controversial figures, Alcibiades, began to push for Athens and its allies to invade Sicily and conquer Syracuse. The fabled treasury of Syracuse could then be used to finance the rest of the war. No one, except the most conservative Athenians, cared that they were starting a second war with one of the other democratic cities on a distant island. They were defeating Sparta, how difficult could Syracuse be? Everyone expected to win quickly, long before a battered Sparta could react. Athens, as head of the Delian League, literally voted to open a second front against a powerful and rich enemy in the middle of another war. From the beginning things did not go well in Sicily. The reason for this was the choice of commanders. At first it looked like Athens was going to make the traditional mistake of splitting command. Both the impulsive Alcibiades and perhaps the most reverent and hesitant noble in the city, Nicias, were put in command of the invasion of Sicily. Likely the idea was for the two to balance out each other. What happened was that, due to a scandal involving the destruction of sacred statues of Hermes just before they left, Alcibiades was recalled shortly after arriving. Since it appeared that he was about to be railroaded on the charge, Alcibiades sailed not home, but to Sparta—and changed sides. Making a military decision, or rather not making it, for twenty-seven days on the basis of one general’s reverence for, and fear of, an omen, was the second mistake. Between the two mistakes, the Delian League and Athens turned near-certain victory into defeat. It took ten more years to lose. Athens held on and raised fleets whenever it could. But the Delian League had lost tens of thousands of soldiers, citizens, and sailors, and nearly its entire fleet in an unnecessary war. The city of Athens and its League were literally and monetarily spent. Eventually, the Spartan side, helped by the defections of Athens’ former allies, won the war and doomed the city. The Delian League was dissolved. Because of two mistakes: fighting a war on two fronts and allowing superstition to override military necessity, Athens was never again the center of Greece or its culture. Your life would today be different had the Delian League prevailed, which it almost certainly would have if its ill-fated invasion of Syracuse had not happened. Greece might have united as a nation. Macedonia would not have been able to overwhelm a united Greece. Persia might well have hesitated to make its many invasions, or perhaps Alexander would have partnered with Greece to invade Persia and change the world. Or Philip of Macedon and his son Alexander might have been obscure footnotes in books about the Delian League’s defeat of Persia. Or there might be chapters about Persia defeating Greece. If Athens had been dominant for more centuries, then would democracy in some form have become the conventional form of government, not the exception, for the next twenty-five hundred years? That surely would have changed everything. I finished the book half a day ago and am thinking how it became uscentric with the US sounding self critical and maybe reinforcing anti US troll-historians.